A 94-year-old woman presented with a lump in her right breast. Her clinical exam showed a large, hard, palpable mass measuring approximately 6 cm in diameter in the upper outer quadrant. Initial mammogram and ultrasound findings were consistent with a benign calcified fibroadenoma. However, upon return to clinic for reevaluation, the patient reported unremitting right breast pain, and imaging findings were highly suggestive of a malignancy. The patient reported no family history of breast cancer. 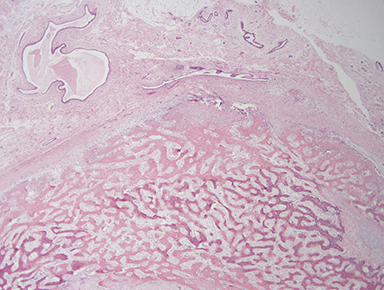 Biopsy revealed an ER/PR- and HER-2-negative malignant neoplasm with osseous differentiation. A right modified radical mastectomy was performed, and no further tests were administered due to the patient’s age and family requests. Craniocaudal (CC) mammography of the right breast shows a mass with associated coarse heterogeneous calcifications in the upper outer quadrant (Figure 1A). Figure 1B illustrates an interval increase in size of a large, lobular mass with dystrophic calcification centrally in the upper outer quadrant, measuring 8.7 cm x 7.7 cm. Due to the large size of the mass, manual technique with limited compression was performed to obtain mammographic images. 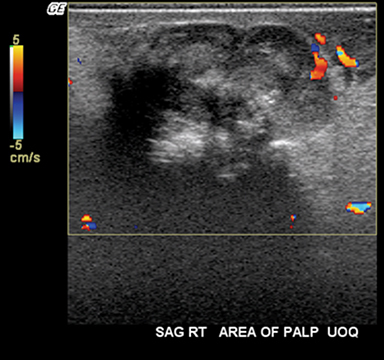 Targeted ultrasound of the palpable mass demonstrates a solid heterogeneous mass with posterior acoustic shadowing located in the upper outer quadrant (Figure 2). This shadowing corresponds to the patient’s palpable mass. There is slight vascularity present at the periphery. 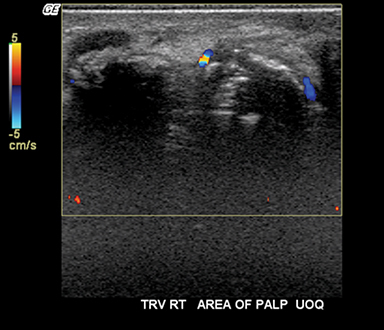 Given the indistinct margins of the mass, it could not be accurately measured by ultrasound. Tissue sections demonstrate a relatively heterogeneous mass composed of trabecular bone, osteoid matrix, cartilage, and spindle cells admixed with epithelioid cells. Regions of osteoid and trabecular bone formation comprise the bulk of the mass, blending indistinctly with regions of cartilaginous and pure spindle cell differentiation (Figure 3). No necrosis is identified. Cells predominantly demonstrate spindled morphology with bizarre nuclei and prominent nucleoli. A lesser population of admixed epithelioid cells with relatively abundant amphophilic cytoplasm and hyperchromatic eccentric nuclei are also seen. Mitotic activity is brisk. Multiple tissue sections are stained with a panel of immunostains, including cytokeratins AE1/AE3 (as shown in Figure 3C), CAM 5.2, CK 5/6, and smooth muscle actin (SMA). Malignant cells were negative for all of these markers, differentiating this pathology from metaplastic carcinoma. 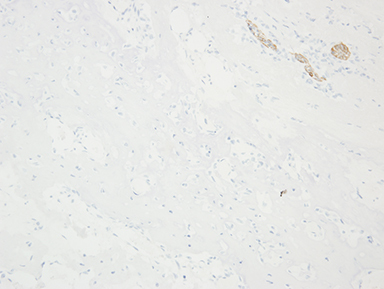 The high-grade soft tissue osteosarcoma of the breast is a cytologically malignant spindle cell neoplasm dominated by extensive production of osteoid and bone associated with the cytologically atypical cells. There is no evidence of conventional carcinoma or any coexistent phyllodes tumor. This tumor usually presents mammographically as a well-circumscribed dense lesion within the breast parenchyma with focal or extensive coarse calcifications.4,6,9 These calcifications were evident in our patient, as illustrated in Figure 1. However, it is important to note that the mammographic features of this tumor may be deceptively benign.6 For instance, in an evaluation of several cases of primary osteosarcoma of the breast, Silver and Tavassoli found the mammographic impression to be that of a benign fibroadenoma in 33% of patients.4 In fact, the initial diagnosis in our case was that of a benign fibroadenoma. Furthermore, metaplastic breast carcinoma should be ruled out before making a diagnosis of primary osteosarcoma of the breast. Mammographically, metaplastic carcinoma generally appears as a high-density mass with circumscribed, obscured, irregular, or spiculated margins.10 This is similar to the mammographic appearance of primary breast osteosarcoma. However, these lesions are often non-calcified,10 which could be useful in differentiating them from primary mammary osteosarcoma. Primary osteosarcoma of the breast is a rare and aggressive malignancy that should be differentiated from two other similar tumors: metaplastic carcinoma and cystosarcoma phyllodes. Due to the rarity and poor prognosis of this disease, it is important that radiologists recognize its mammographic features in order to ensure proper management and optimize patient outcomes. Voutsadakis IA, Zaman K, Leyvraz S. Breast sarcomas: current and future perspectives. Breast. 2011;20(3):199-204. Jernstrom P, Lindberg AL, Meland ON. Osteogenic sarcoma of the mammary gland. Am J Clin Pathol. 1963;40:521-526. Vorobiof G, Hariparsad G, Freinkel W, Said H, Vorobiof DA. Primary osteosarcoma of the breast: a case report. Breast J. 2003;9(3):231-233. Silver SA, Tavassoli FA. 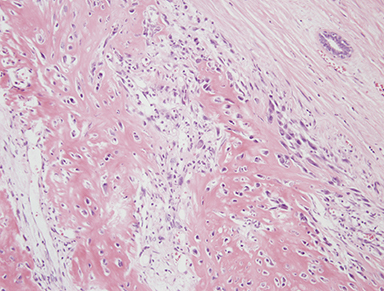 Primary osteogenic sarcoma of the breast: a clinicopathologic analysis of 50 cases. Am J Surg Pathol. 1998;22:925-933. Rizzi A, Soregaroli A, Zambelli C, et al. 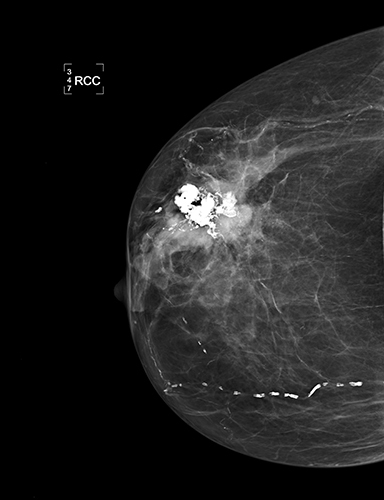 Primary osteosarcoma of the breast: a case report. Case Rep Oncol Med. 2013:2013. Remadi S, Doussis-Anagnostopoulu I, Mac GW. Primary osteosarcoma of the breast. Pathol Res Pract. 1995;191:471-474. 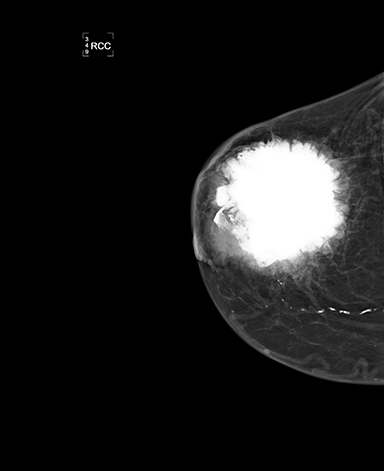 Barnes L, Pietruszka M. Sarcomas of the breast: a clinicopathologic analysis of 10 cases. Cancer. 1977;40:1577-1585. Bahrami A, Resetkova E, Ro JY, Ibanez JD, Ayala AG. Primary osteosarcoma of the breast: report of two cases. Arch Pathol Lab Med. 2007;131.5:792. Rosen PP. Rosen’s Breast Pathology. 2nd ed. Philadelphia, PA: Lippincott William & Wilkins; 2001:425-453, 818-819. Gunhan-Bilgen I, Memis A, Ustun EE, Zekioglu O, Ozdemir N. Metaplastic carcinoma of the breast: Clinical, mammographic, and sonographic findings with histopathologic correlation. AJR Am J Roentgenol. 2002;178:1421-1425. Guys N, Khan S, Kezlarian B, Shah BA. Primary osteosarcoma of the breast. Appl Radiol. 2017;46(12):28-29. Prepared by Mr. Guys while a Medical Student at Wayne State University School of Medicine; Dr. Khan while a PGY5 in the Department of Radiology; Dr. Kezlarian while a PGY3 in the Department of Pathology and Laboratory Medicine; and Dr. Shah while a Senior Staff Radiologist in the Division of Breast Imaging at Henry Ford Hospital; and a Clinical Associate Professor at Wayne State University School of Medicine, Detroit, MI.